Discover our latest research into innovative approaches to sustainable shrimp farming! 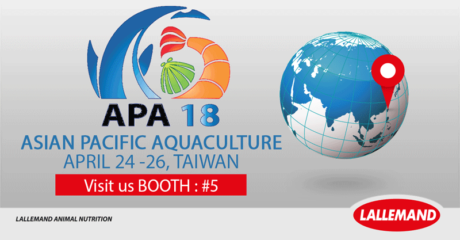 We are pleased to announce our participation at Asian-Pacific Aquaculture 2018 conference and exhibition in Taipei, Taiwan from April 24 to 26. We invite you to visit and meet our team at booth #5. Along with our participation in the exhibition, Eric Leclercq, Ph.D., Aquaculture R&D and Technical Support Manager for Lallemand Animal Nutrition will be presenting three scientific studies about innovative microbial based approaches for shrimp nutrition and health to promote sustainable farming. Asian-Pacific Aquaculture 2018 is described as the place to learn about the latest in aquaculture and see the newest technologies from around the world. It is organized by the World Aquaculture Society and hosted by the National Taiwan Ocean University. Program and registration here.